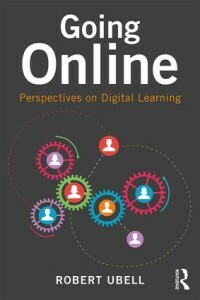 In Going Online, Bob Ubell’s new book on digital education, covers what it is, how it works, where it came from, and where it may be headed. Ubell says that it is not technology alone, but rather unconventional pedagogies, supported by technological innovations, that truly activate today’s classrooms. He argues that innovations introduced online—principally peer-to-peer and collaborative learning—offer significantly increased creative learning options. In his OLC webinar, Dean Ubell will explore the chapter, “What You Can Do Online but Not on Campus,” a review of unique experiences in virtual courses—anonymity, learning analytics, writing and reflection. He will also cover parts of another chapter, “Why Faculty Don’t Want to Teach Online.” Excerpts appeared in The Chronicle of Higher Education and Inside Higher Ed. Purchase Going Online through OLC – members receive a 20% discount. Robert Ubell is Vice Dean Emeritus, Online Learning, at NYU Tandon School of Engineering. Recipient of the highest honor given for individual achievement in digital education, the A. Frank Mayadas Leadership Award, he is a Fellow of the Online Learning Consortium. He serves on the Advisory Board of the Online Learning Journal and is a member of McGraw-Hill Education’s Learning Science Research Council Advisory Board. Buy Robert Ubell's Going Online today!